When thinking about pearls, the first thoughts that come to mind are visions of timeless grace, wistful elegance and a mysterious sexiness. Above all else, what comes to mind is the complete and total femininity that pearls embrace. After all, how often do you find pearls in men's jewelry? Mother of pearl on cufflinks or rings and perhaps a single pearl tie tac but pearls are delicately feminine by nature. So, it isn’t hard to understand why their presence can be noticed on some of the hottest pieces of jewelry today. Their alluring appeal is in addition to the versatility of their use. Pearls make excellent accents to any outfit due to their neutral tones. Their price point can vary greatly depending on whether you are choosing fashion forward fresh water pearl jewelry or elegant and timeless strands of Akoya or Tahitian and South Sea pearls. Therefore, from one end of the spectrum to the other, you know you can always find pearls that have both striking style and cost appeal to suit almost everyone. 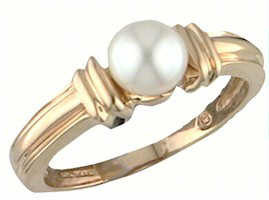 Keep this is mind when contemplating gift giving or self purchasing and come see our new collection of pearl jewelry. We have pearl jewelry sets including the necklace, bracelet and stud earrings for someone who wants to jump start a pearl collection. We have these sets in chocolate fresh water pearls as well as traditional Akoya white pearl sets. We also have individual pieces of pearl jewelry so you can collect them at your own speed. We have stands of black pearls as well as multi colored strands. We have "tin cup" pearl necklaces that feature fun dyed pearls in shades of green, brown, and golden cream and caramel in combination with gold chain. We have pearl earrings in studs and dangles in all colors and sizes. We are excited about our new pearl collection and think you will be too. We invite you to come view our pearls while the selection is still plentiful.